The perfect bowl of creamy steel cut oats. This recipe makes a large batch that can be reheated for a quick breakfast throughout the week! toppings of choice – cinnamon, banana, berries, hemp seeds, chia seeds, maple syrup, etc. Place oats, water and salt into a saucepan and bring to a boil, watching carefully so the water doesn’t boil over. Turn down heat quickly and allow the oats to simmer for 1 minute. Remove from heat. Cover with a lid and let stand overnight at room temperature. The next morning, uncover the saucepan, stir and enjoy. They’ll be creamy and ready to eat but if you want them to be warm, bring to a simmer over low heat and simmer until warm. Portion the oatmeal into bowls. Dress with toppings of choice. I love banana slices, berries and nut butter. For storing: let the leftover oats cool and place in an airtight container in the refrigerator for up to one week. 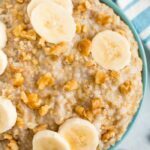 You can reheat the oatmeal on the stove top or in the microwave throughout the week for a quick breakfast (just add a little water or milk if it gets too thick).